Medlars are one of our ancient British fruits making a come back. During the middle ages, people would have been very familiar with this strange looking small fruit which is actually eaten in it’s over ripe or “bletted” stage. No longer in commercial cultivation, old gardens are generally home to the only trees in the UK. Some of these trees will be about two hundred years old. Tracklements Ltd. in Wiltshire have launched a delicious new Medlar Jelly. Great with turkey, pheasant or game it is perfect for the Christmas table or the cold cuts’ table for left-over meat. 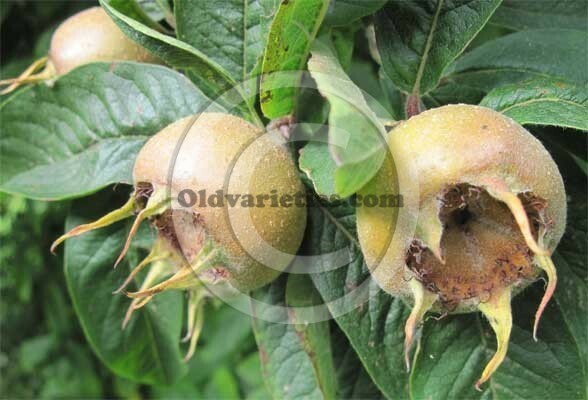 The medlars for this jelly were picked by the kind people int he surrounding area. You can see pictures of the donatees and picking adventures on their facebook page. Tracklements started a quest to find some of these ancient medlar trees and the option of taking the unused fruit in return for finished product. BBC Countryfile heard of this project and joined them picking for a day. We are aware that there are various food producers around the UK who will take in unused fruit from gardens and orchards in return for a quantity of finished product. It would be handy for producers and growers if we could create a database of people willing to link up and put the country’s unused fruit to good use. If you are interested in joining our list then please contact us via the comments section at the end of this post.